NL3265 is designed specifically for use in very cold environments to -54°C (or -65°F). It is suitable as a premium multi-purpose hose for air, water (not food grade), kerosene, fuel oil, and some chemical applications. 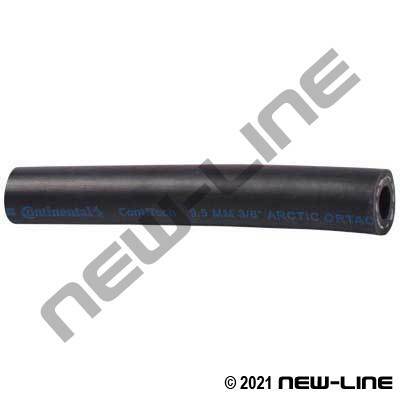 It is a flexible, oil and weather resistant hose that provides excellent durability in subzero temperatures. This hose is also listed in our 'Petroleum Section' of this catalogue. Although the Goodyear Ortac has been the proven industry standard for years, recently some lower cost options for less demanding arctic applications have come onto the market (optional NL3280). Typical Fittings: N400/N400L Brass or nylon barbs (smaller sizes), Universals, N176 Hex Hose Barbs, camlocks, brass ferrules, pinch clamps, punch clamps, crimp sleeves. Scovill fittings & ferrules to be used in 1" to 2" petroleum applications. Construction: Tube: Black low-temp synthetic rubber. Cover: Black (1/4"-1") or Blue (1-1/4"-2") ultra-low temp synthetic rubber. Reinforcement: Braided synthetic cords. Detail Comments: For larger sizes and stock, please refer to our NL3270 Arctic Ortac (with static wire) and NL3109 Arctic Softwall in the petroleum section.